I am a Summer time kinda girl, but I do love when Fall rolls around. I think it’s the food that has me hooked. Who can turn down all this Pumpkin, Apples, and Caramel? Ooooh…..CARAMEL! I am one of the first to snag the Fall Flavored Coffee Creamers. Nothing can create delight in your day like a Caramel Macchiato flavored coffee and a yummy baked good. 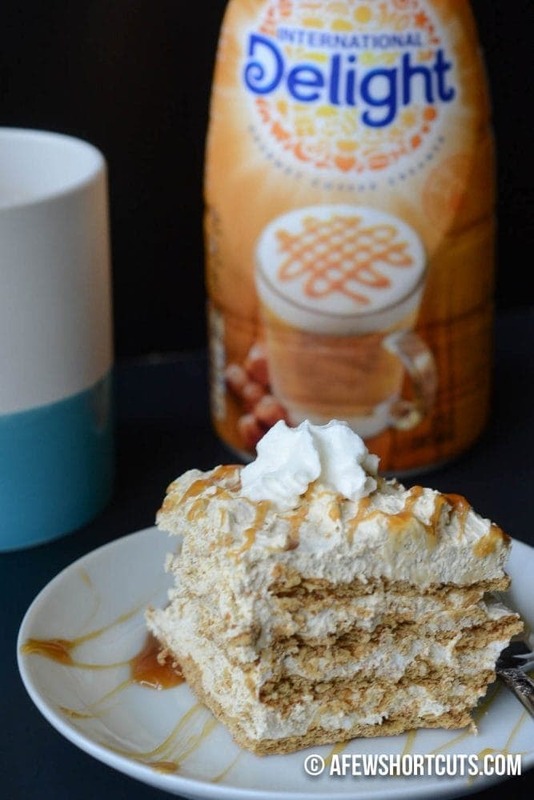 Since it is still hot outside, I wasn’t ready to crank on the oven yet, so this Caramel Macchiato Icebox Cake will have to do. It’s a rough life y’all. In a large bowl mix a softened tub of whipped topping, vanilla pudding mix, International Delight Caramel Macchiato Creamer, milk….and my secret ingredient. Espresso Powder. I used one of those Instant espresso packets and just measured 1 tbsp out. Carefully fold it all together and let it sit for a minute. On a cake plate, or in an 8×8 pan. Place a single layer of graham crackers. 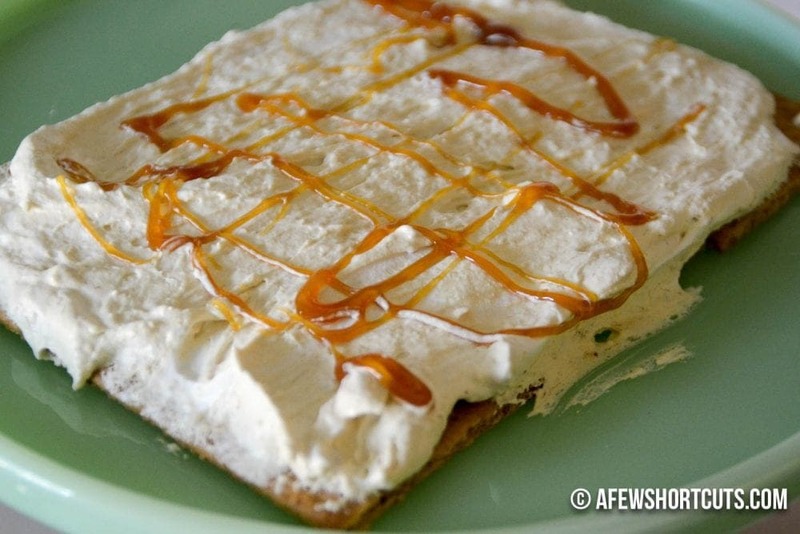 Top with 1/4 of the whipped mix, then drizzle with caramel topping. 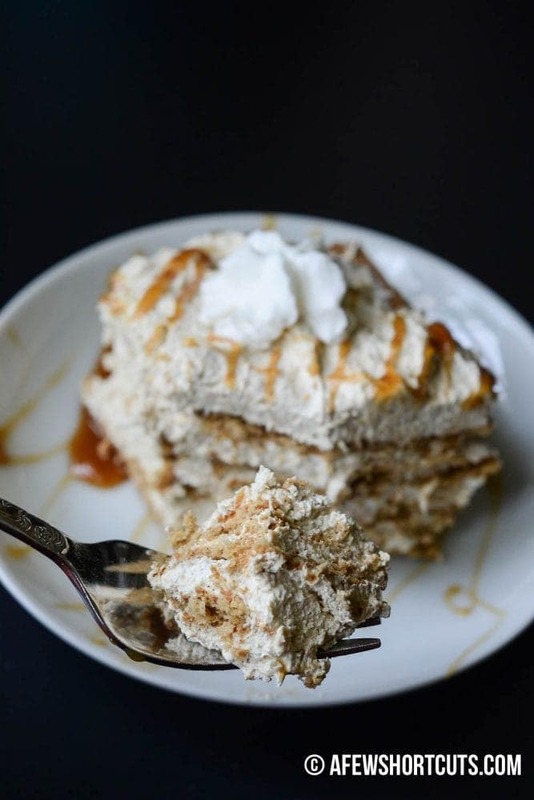 Continue this until the final layer is just the whipped topping drizzled with caramel. Pop that bad boy in the fridge overnight or for at least 4 hours. That is the hardest part of this whole recipe….the waiting. When it comes out of the fridge, it will be this creamy masterpiece of fall and coffee flavors that you can’t wait to dig into. 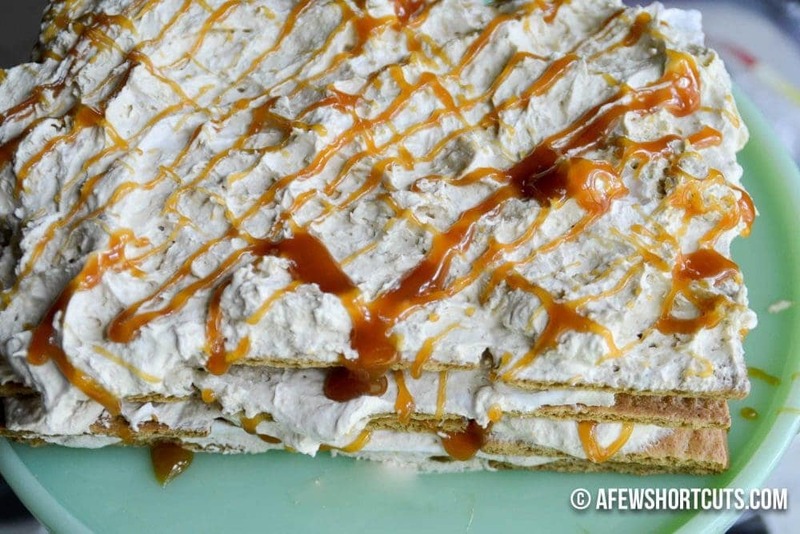 The graham crackers are softened and cake like consistency from sitting with the cream & caramel. The entire dessert is light and heavenly. It reminds me of a tiramisu. You have to try it! Want more Delightful Moments? Don’t miss out on snagging coupons, and more from International Delight too! Go now to check out their site. 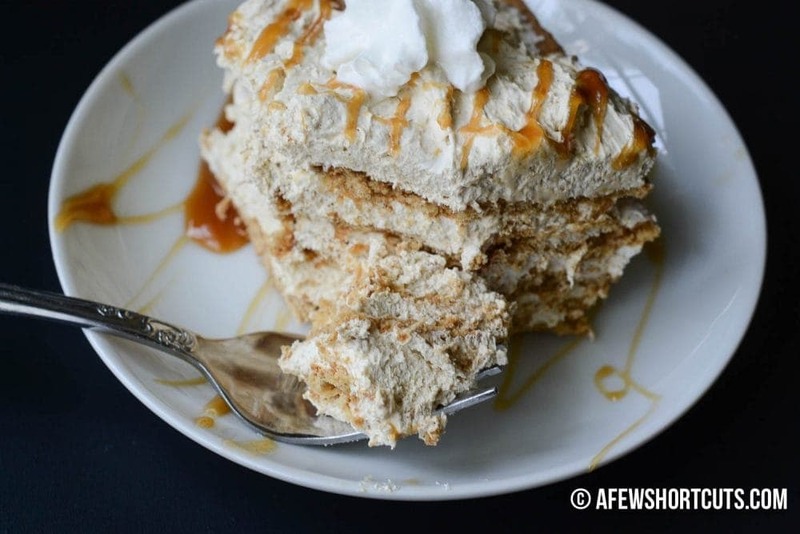 This Caramel Macchiato Icebox cake is very reminiscent of a tiramisu. Very light and creamy with a hint of the coffee and caramel flavors. A perfect dessert for with a cup of coffee or espresso. In a square baking dish or on a cake plate lay down a single layer of graham crackers. 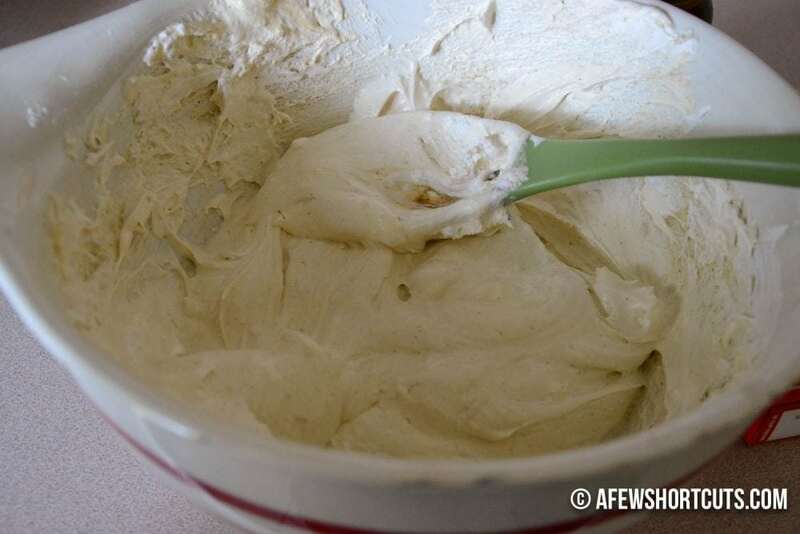 In a large bowl gently mix together whipped topping, pudding mix, espresso powder, creamer, and milk. Let sit for a couple minutes. Begin to layer 1/4 the cream on top of the graham crackers. 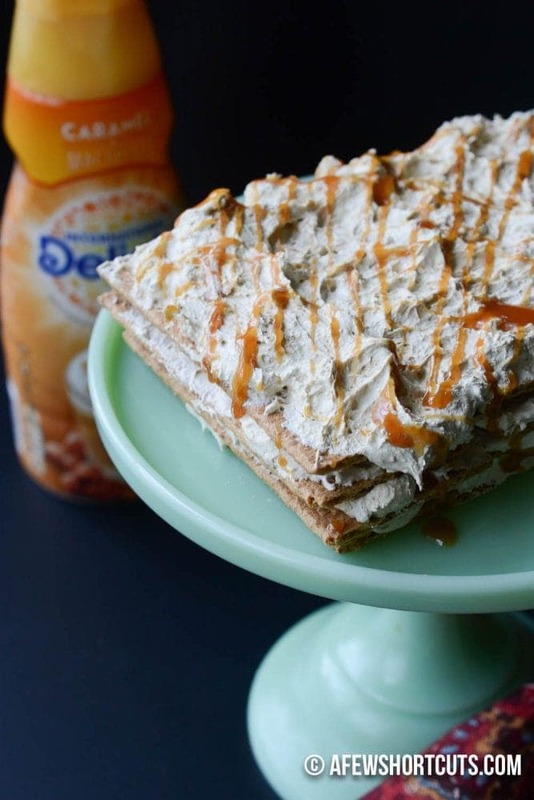 Drizzle with some caramel topping, then top with another layer of graham crackers. Repeat 3 more times with cream being the final layer on the top. Drizzle with caramel topping. Refrigerate over night or for at least 4-5 hours. Cut as you would a cake and serve.